Growing up hockey was my sport of choice. As a teenager I was an average player with a desire to get better. During a practice I vividly remember running a play that I struggled with. After the play the head coach skated over to me and said “Braland, you have got this, you can make the play, I know you can.” We ran the play again and this time I stepped up and did what needed to be done. Little did I know but his words of encouragement helped me to overcome many obstacles throughout my life booth on the hockey rink and beyond. Encouragement is the action of giving someone support, confidence, or hope. It can motivate and persuade a person to do something or continue to do something. Encouragement matters. People need to be reminded that they are headed in the right direction, that they are making progress, that they can overcome obstacles, and that God is at work in and around them even when the work is hard. Encouragement is a skill that can be leveraged by anyone to help others reach their full potential. Here are four practical tips to help you bring out the best in others for the glory of God. The more specific the better. One specific encouraging note or word can flow into other areas of a person’s life filling in cracks that you didn’t even know were there. 2. Be genuine. Fake encouragement smells like fake flowers so don’t serve up a big dish of fake. Be emotionally engaged in your comments, let them flow from your heart whether they are written or spoken. When you encourage someone, your body language speaks louder than your words so when you share with someone look them in the eye and put a smile on your face. 3. Be timely. Encourage people as soon as possible so that whatever it is you are encouraging them about is fresh on their mind. Encouragement loses its impact when you say it too late. When a person is running a race and closing in on the finish line, they need encouragement before they get to the line, not a week after the race. 4. Be generous. Don’t withhold encouragement from those who need it. Encourage others without being jealous of them and encourage often. Great encouragers don’t see the other person as competition, they see them as a team mate. Teams that encourage one another will always bring out the best in one another. One of my favorite biblical examples of encouragement comes from the relationship between Paul and Timothy. According to Acts 16:1-3, Paul met Timothy while he was traveling through Lystra. Paul discovered that Timothy was the son of a believing Jewess and a Greek father and that people spoke highly of him. Paul valued character and saw Timothy’s potential. Acts 16:3 informs us that “Paul wanted to take him [Timothy] along on the journey.” This was the moment when the loving mentor relationship between Paul and Timothy began. Think of two people that you can encourage today. How can you encourage them in a specific, genuine, timely, and generous way? How can you be more consistently encouraging with your leaders? Encouragement brings out the best in others, so learn to be an encourager. Even though almost every pastor would say that making disciples is important, very few actually do. Most pastors simply feed the flock week after week and day after day. They care for the sick, pray with the hurting, and take care of day to day operations at the church, all of which are important. But make disciples? Not really. Barna research Group conducted a fascinating study that revealed 51% of Christians have never heard of the Great Commission. Twenty five percent of Christians have heard about the Great Commission but can’t recall what it actually means and only 17% claim to know what it means. (https://www.barna.com/research/half-churchgoers-not-heard-great-commission/, accessed 28 June 2018). Whose fault is this? If you are a pastor like I am, it’s our fault. Since we are the primary teachers of God’s word it’s our responsibility to teach people about the Great Commission because it is the primary mission of the church. If your church isn’t obeying Jesus command to make disciples then you need to change business as usual. Here’s how. 1. Prioritize the gospel. Teach the Word of God and always draw people back to the good news that Jesus died for our sins and that salvation is found in no one else. Pastors can focus on so many other pressing matters that they actually forget to preach Christ crucified. You need to share the reason why the gospel matters to everyone. Share it often and with share it with passion and conviction. 2. Emphasize evangelism. In my opinion, the days of door to door evangelism are gone. Years ago a few people would enjoy knocking on doors to share the gospel but they were by far in the minority. What does work is friendship evangelism. In a nutshell that means be a disciple and live out your faith every day regardless of whether you are at work, home, church, or anywhere else. You need to teach your congregation to do this. Teach them how to share their personal story and what it looks like to live out their faith. 3. Model disciple making yourself. If you want to make disciples, make disciples. You should be the first one to live out your faith and talk about it with others. If everyone you know is already a believer, get some new friends. When you live out your faith it will give you something to talk about when you preach and this will inspire others to do the same. 4. Champion discipleship. Once you prioritize disciple making and start to talk about it others will follow your lead. It might not happen overnight but when you champion it, others will celebrate it. 5. Hold your church accountable. Ask your key leaders who they are trying to reach for Christ. Talk to them about who they are sharing their faith with. Ask them who they are inviting to church. Tell them to ask their ministry teams and friends the same question. As the pastor, you need to set the tone and you will only be able to do this effectively if you are making disciples yourself. Now is the time to go all in when it comes to making disciples. I believe that we are living precariously close to the return of Christ and that Jesus will indeed return when the whole world hears the gospel. You might not be able to reach the whole world, but you can reach your family and neighbors and teach your congregation to do the same. Jesus has given us our mission, now it’s time to fulfill it. Disciple making starts with you. It seemed evident that God brought Pastor Lyle to join the team at First Church as the Pastor of Ministry. He was sharp, a good communicator, and well-liked by the search team. He was responsible for leadership development, small groups, and campus ministry. The first few months on staff he showed great promise. Pastor Lyle launched a new discipleship ministry, mentored several men, and visited those who were hospitalized. At staff meetings, he shared good insights and bought into the vision. But then some underlying negative characteristics began to surface. In his effort to do ministry, Pastor Lyle was hard on people. It’s not that he didn’t do ministry, he did. But he left a trail of damaged volunteers in his wake. In his pursuit of power and influence, he offended other staff members by treating them like cheap tools. He had a need to always be right, and this created disunity among the rest of the staff. Multiple attempts to salvage the situation were made by the lead pastor and elders, but after two tough years it was evident that Pastor Lyle was not the right pastor for First Church. Several hard conversations later, Pastor Lyle was asked to leave. Instead of leaving with grace and dignity, he tossed a turd in the proverbial punchbowl, picked up his cup, gave a toast to poor leadership, and left as if he were a righteous prophet stoned for speaking truth. His poor departure had a ripple effect on relationships within the church, causing some to leave and others to mourn for the whole situation. This scenario might not be your scenario right now, but it certainly could be. If you have been in ministry for any length of time, you have had a staff member or key lay leader leave the church poorly. Not every staff member will be with you forever. Change is part of life. Sometimes good staff leave for good reasons; it happens. And when good staff leave for good reasons they should be celebrated and sent out with love and grace. This can be a win-win scenario and bless the person who is departing. Other times a staff person might need to be asked to leave for impropriety, immorality, or authority conflicts. Some staff resign because they are upset, have unmet expectations, or are the wrong fit for the job they are doing. People who leave because they can’t do the work rarely ever admit it. I have talked to dozens of pastors who have experienced staff transitions, and rarely is a staff member or lead pastor honest enough to admit they could no longer do the job they were hired to do. Apparently it’s much easier to blame others that admit ones’ limitations. These situations are tough and taxing on everyone. 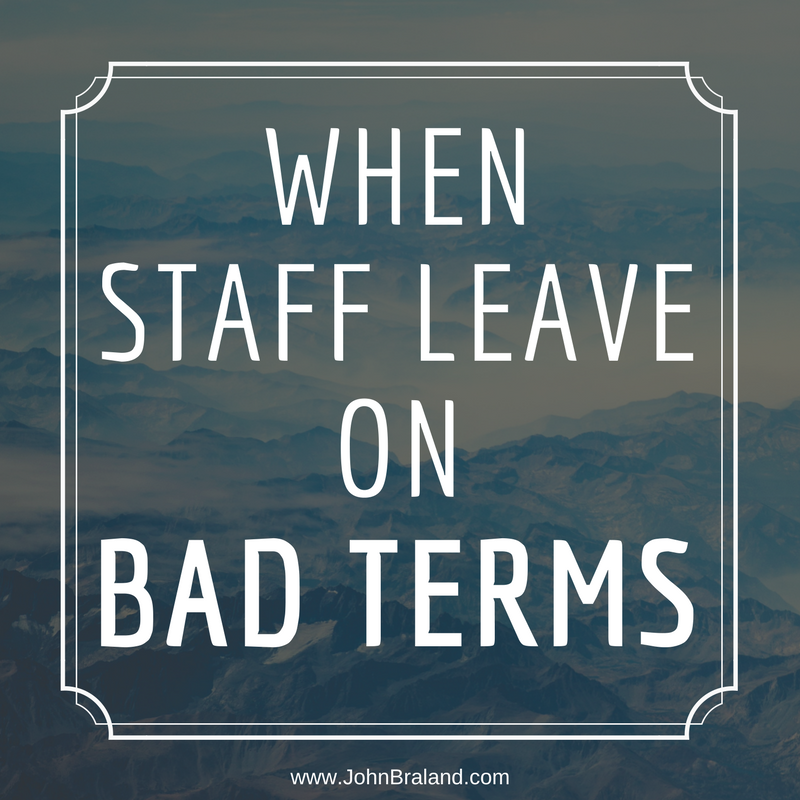 If you have a staff member leave on bad terms, expect these ten ramifications. 1. You can expect people to leave the church. Churches are glued together by relationships. The fact that your relationship with the departing staff is less than ideal doesn’t mean they don’t have other good relationships. You can expect some of the staff member’s close friends to leave the church. When they do, there isn’t much you can do about it. Just find a way to love them as they leave. You can bet they based their decision on one version of the story or left out of loyalty to the relationship. Do everything you can to honor Christ in your response to others. 2. You can expect people to talk a lot. Whenever you have to release a staff member, people will want to know the reason. How much do you tell them? This requires discernment, since each situation is unique. You need to share enough information so that it becomes clear that you are not hiding information. I learned this lesson the hard way. In an effort to save face for one staff member we fired, we did not divulge enough information about the reason he was fired, and that undermined my credibility with several families who wanted to know more but I refused to tell them. Several months later, after learning I should share more, I began to share more with those who asked, and they completely understood the decision. I wish I would have done this right away. I had to come to the conclusion that I was not morally responsible for the facts that led to that staff member’s dismissal. Telling the truth is not slander, so tell the truth and find peace in it. 3. You can expect the staff to ask you a lot of questions. Your staff already knows more about the situation than you think they do. You need them to be your advocate because others in the church will pry them for information. They need to know more than most, but they don’t need to know every detail. Be open to receiving their questions, be authentic in your response, and share as much as you can with them. Love them, and help them through the situation. 4. You can expect the staff to need your support. Your staff might not agree with the reason the person was fired or be upset that they left, but ultimately you want to pastor your staff through the transition. Help them to grieve if they need to grieve or stay humble if they are thrilled the person is gone. 5. You can expect rumors to spread. If you don’t give enough information as to the reason the staff member is gone, people will tend to fill in the gaps with opinions and share them as facts. The best way to handle difficult staff transitions is to have the elders or leadership team write a “one voice” statement that outlines the facts. Make this statement available to anyone who asks for it. Do this with the realization that even when the facts are shared, you can still expect rumors to fly. Stick to the facts and repeat them often in love with grace. 6. You can expect Satan to step into the middle of the mess. Satan loves to create confusion, disillusionment, and division. He has mastered it over the years. Since the church is God’s chosen vessel to advance His Kingdom, the church is the place Satan will strike the most. Satan can magnify bad circumstances in a hurry, making you feel like the entire church is going to explode. Stick to the truth, and trust God with the outcomes even though you can’t control them. 7. You can expect sniper fire. Let’s be honest, not everybody plays nice in the sandbox. People will accuse you of not following God, they will say you are not spiritual or deep, they will question your prayer life and may even hint that you are demonized and unsaved. Because we are all sinful people, we are all fully capable of hurting others. When one of our staff left on bad terms, I heard rumors from my inner circle of friends that they believed the Holy Spirit had left the church and that I was not following God at all. These comments and accusations were meant to cause damage. They hurt the church and also hurt me and my family personally. Every pastor will encounter sniper fire, but not every pastor heals from it. Many get discouraged and would rather quit than take more shots. Spiritual leaders within the church will take shots as well, so you need to minister to them even when you are being fired at yourself. The key is to have thick skin and a tender heart. If you have thin skin and a hard heart, you won’t last long in ministry. Good captains always prove themselves in rough seas. 8. You can expect to go through a grieving cycle. When someone dies, those who were close to that person grieve. When a staff member leaves for good reasons or because the church asked them to leave, you will go through a grieving process. You might feel a sense of joy or intense anger or pain. Be honest with yourself when you grieve. Get outside help if you need to. Talk to other seasoned pastors, see a counselor, talk with trusted friends and admit your own pain in the process. 9. You can expect to have a few curve balls thrown at you. People you thought were on your team will leave your team, and others you anticipated would be upset won’t be. One church celebrated a staff member’s accomplishments after he said he was resigning and threw him a going away party on his last day. The church even gave him a month’s wages and paid his insurance out of their generosity. But before he left, he spent his last two weeks meeting with all of his leaders one-on-one, blasting the church leadership and lead pastor. This was wrong and sinful, and he did it while he was being paid by the church. Most of his leaders ended up drinking his Kool-Aid and leaving the church. What could have been a healthy transition turned toxic. You might get hit with a few curve balls, and when you do they are going to hurt. Put some ice on the wound and stay focused on leading your team because they need you. 10. You can expect God to get you through it. Several years ago, I was meeting with one of my mentors and describing a tough situation. He looked at me and reassured me that I would get through it and be a better leader because of it. At the time, I had my doubts, but looking back, I realize he was spot on. I did get through it. The damage was less than I anticipated, the pain was more real than expected, and God was more faithful than I imagined. Not only did God get me through it, he grew me through it, and I’m grateful for it. If you have recently been fired, resigned, or, dare I say, left a church on bad terms yourself, you have the ability to honor Christ even if you don’t agree with what the church did. Make amends where you need to, and spend some time healing. The manner in which you leave a church reflects your level of spiritual maturity. Ultimately we are all the body of Christ called and commissioned to make disciples, so let’s stay focused on that. Do the best you can to leave strong so that you are always welcome to back if you should chose to visit. I want to encourage you to stay strong in your calling. Churches are full of sinful people trying to fulfill a holy mission and it’s tough. If you have no idea what I’m talking about in this blog, file it away for later because one day you will. Now you will know what to expect when it does happen. God will help you through it because the church is the bride of Christ and she is beautiful even though she is full of imperfect people. ​Years ago when we planted Freshwater we came up with seven core values. These core values have helped guide us and keep us focused over the years. We launched the church with no paid staff other than myself and a handful of volunteers. Since launching, we have revised the wording of our core values several times but they have essentially remained the same. Our core values have helped shape who we are as a church. They help us make sure we have our priorities in order and ensure we focus on them. Fast forward to today. Now Freshwater has fifteen paid staff and dozens of volunteer staff. We still use our core values to guide the church and keep our priorities in order. If a ministry, program, or new initiative does not align with our core values we cut it. One of our paid staff team members approached me and said that he loves our church core values and asked if we have any staff core values to help our paid staff team know what is expected of them. We didn’t, so we set out to create a set of core values that reflect the type of staff environment that we want to cultivate. We began by creating a first draft (using other church examples and our own original thoughts) of the values that are important to us. Then we shared the draft version with our existing staff team. After reviewing it at a staff meeting, we gave them the opportunity to speak into it. We took their suggestions and wrote a new version and shared it with them again. After a couple more revisions we settled on the following core values. Our final version reflects the culture we want to develop and keep. Now our staff core values go on every job description and we hold one another accountable to them. These core values have helped us to thrive as a team. Infectious Fun: Our staff potential is greatest when there's joy in being a team. Balancing work and play, we create environments that create fun and togetherness. Contagious Care: We prioritize people because we care about them. Therefore, we do our best to do whatever it takes to get the job done. Impactful Excellence: With our given resources, we intentionally lean into our strengths to do the best we can to glorify God and build up people. Stewardship of Soul Care: Since we can't give what we don't have, we will invest in a healthy body, mind, and soul for ministry. Strategic Flexibility: Because church can be messy, we commit to collaborate as we're led by the Holy Spirit and to improvise when necessary. Unwavering Accountability: Because the eternal impact we have is so important, we hold one another accountable for doing the work God has called us to do. As your church grows, so will your staff team. As the staff team grows, you need to create and manage the culture of the organization. By putting your staff core values in writing, you help create the culture that you want to see. If you don’t put your values in writing, you can’t expect people to know what a healthy team environment looks like in your organization. Without a set of staff core values, your staff culture may stagnate or die a slow death caused by a noxious weed on your staff team. Your staff core values will help you clarify what is expected from every member of your team so that everyone wins. There are three types of feedback: Appreciation, coaching, and evaluation. All three types of feedback are important, but they are also easily tangled to the point the feedback often does not resonate and can even be destructive. This is because everyone has feedback triggers that impact how we receive feedback. If a person feels the feedback is untrue, wrong, or unhelpful it triggers feelings of anger, resentment, or frustration. If the relationship between the giver and receiver is stressed, the feedback may not be received or even given with the right motives. If the feedback makes us feel insecure it triggers a person to fight for their identity thus affecting the feedback. The three types of feedback. Appreciation. The purpose of appreciation is to see, acknowledge, connect, motivate, and thank. When you appreciate someone, you let them know they matter. When your boss tells you how grateful they are to have you on the team, that’s appreciation. Appreciation is about relationships and human connection. It reminds us that we matter and are being recognized for our contributions to the organization. Being seen and understood by others matters. When someone shows appreciation to you, it energizes you and helps you lift your head a little higher. It puts a smile on your face and satisfaction in your heart. Think of a baseball coach who tells one of his players they are glad they are part of the team even before a single game is played. All of us want to know that we are needed and wanted on the team and if that appreciation is shown before their performance is gauged, then it is even more meaningful. Coaching. The purpose of coaching is to try to help someone increase their knowledge, sharpen skills, improve capabilities, or change. The focus is on helping someone to improve in some way. It might be to be a better communicator, manager, or to refine their skill set. Think of a baseball coach helping his player improve their batting skills. He might advise the player to stand with their feet spread apart, hold their elbow up, and keep their eye on the ball. If they do these three things they will have a better chance of hitting the ball. Evaluation. The purpose of evaluating is to rank someone against a set of standards, to align expectations, or to inform decision making. Evaluation helps a person know where they stand. Students receive report cards with grades to let them know where they stand. Runners evaluate themselves based on their time to run certain distances. Weight lifters are evaluated on the amount of weight they can lift. Your family evaluates your cooking skills by their comments of approval or their silence. Think of a baseball player’s batting average. Their batting average helps the coach create the batting order that will help the team win. Although every player is important, the best players usually hit in the top of the order. Evaluations are always, in some respect, comparisons to a set of standards whether written or implied. Authors Stone and Heen write “Evaluations align expectations, clarify consequences, and inform decision making” (Stone and Heen, Thanks for the Feedback, p32). Each form of feedback is necessary and important because they each satisfy a different need that we have. If you are giving feedback, be sure to clarify what type of feedback you are giving. If you are receiving feedback, ask what type of feedback they are providing. 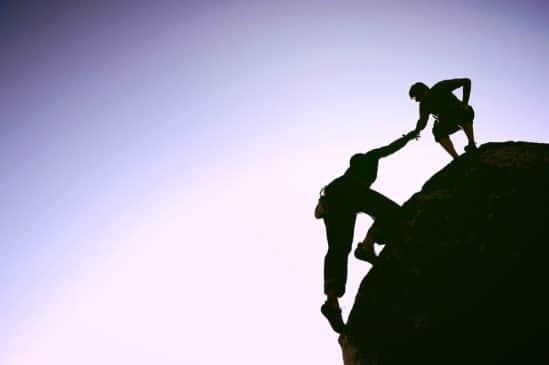 By connecting the giver to the receiver in a constructive way, it will help you and your organization to make forward progress. Every summer I take several weeks off to take vacation, study, do strategic planning, and visit churches. Since I pastor a church, I don’t get many opportunities to attend other churches unless I am off for the weekend. Visiting other churches gives me the opportunity to experience church life as a guest. I get to observe church life as an outsider rather than an insider and what I have found over the years has helped me bring back fresh insights to my own church and minimize weaknesses that could potentially prevent people from connecting with God. Every pastor wants their church to be warm and inviting to new guests, but many churches flat out are not. I think there are seven characteristics that inspirational churches share. You may add one or two to your own list, but if you want your church to be warm and welcoming to guests, you should pay attention to these characteristics. A “paradigm shift” is a significant change in the paradigm of any discipline or group. This shift is dramatic alters the landscape that was previously thought to be the standard. It’s that “aha!” moment when one or an entire society sees things in such a new light that the old ways of thinking are set aside and a new model is adopted. Each paradigm shift causes people to discard a previous standard in favor of this new model. For example, scientists used to believe that the world was flat. This belief was based on the fact that they could only see for a limited distance. Once they began to explore further and further out they concluded that the world is not flat after all, that it is actually round. This discovery had profound ramifications on the scientific community and everyone else. New churches tend to have clear missions. They are committed to reaching people and growing the church. But as the church ages, the mission is subject to drifting. It’s not that the members don’t care about reaching lost people, they just get more concerned about meeting their own needs. Years ago I read a powerful illustration that has helped me to understand this drift and fuel my desire to continue to reach people for Christ. I hope that it will do the same for you.